April O'Leary kayaking to her home in Conway, South Carolina. South Carolina was spared the worst of Hurricane Florence’s fury when the storm made landfall in North Carolina on September 14, but did not escape its catastrophic impacts. Nearly two weeks later, the state was still contending with historic flooding. Flooded house in Socastee, South Carolina. Florence lingered over the Carolinas, dumping more than 30 inches of rain in some areas. Five rivers and the IntraCoastal Waterway crested several feet above major flood stage, resulting in flooding that will last for weeks to come in parts of South Carolina. Cities and towns on its northern coast are experiencing the worst of it, where standing water remains in buildings along the Intracoastal Waterway and near riverbanks deep into the Carolinas. Flooded mobile home in Bucksport, South Carolina. Pine Grove Baptist Church in Brittons Neck, South Carolina. Jane and Chris Ochsenbein, owners of Gator Bait Adventure Tours in Myrtle Beach, South Carolina, took me on a kayak tour of flooded areas 10 days after the storm hit the coast. On September 26, we met up with April O’Leary, a program officer for Winyah Rivers Foundation and the Waccamaw Riverkeeper program, in Conway, a city about 15 miles from South Carolina’s coast. Chris Ochsenbein pulling a kayak into floodwater in Conway, South Carolina’s Sherwood neighborhood. April O’Leary, in front of her flooded home in Conway, South Carolina, on September 26. We paddled our way to her home in Conway’s Sherwood neighborhood the day that the Waccamaw River crested, reaching 21.16 feet, 7 feet over major flood stage. O’Leary later told me that level set a new record by more than three feet. The previous record, 17.89 feet, was set following Hurricane Matthew just two years earlier. The streets were quiet. Everyone had evacuated before the flooding became too dangerous, as far as O’Leary knows. The only people we crossed paths with were checking their homes like she was. Flooded home in Conway, South Carolina. 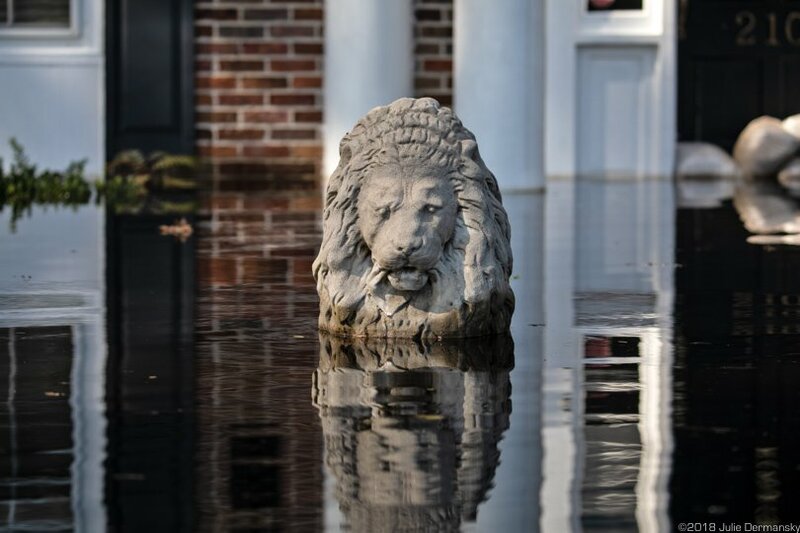 Lion sculpture in front of a flooded home in Conway, South Carolina. I first met O’Leary and the Ochsenbeins in 2016 after Hurricane Matthew’s floodwaters affected areas along the Waccamaw River and Intracoastal Waterway, but that storm didn’t come close to flooding O’Leary’s home. With Florence, however, she finds herself in a new dual role: explaining to the media the environmental issues that affect the Winyah rivers basin, and dealing with being a flood victim herself. The day before I caught up with O’Leary, she was featured on a local news program as she rescued monarch butterflies from her home in laundry baskets. She plans to care for them, and then release them in a nearby flood-free area where there are plenty of flowers. The Ochsenbeins described living through Florence’s aftermath as being in the middle of a slow-motion disaster. Their home is on high ground in Socastee, just west of Myrtle Beach, and didn’t flood. But many of their friends’ and neighbors’ homes did. They have been posting videos of the area on Facebook while monitoring the floodwaters and helping others by lending them kayaks to reach their homes and assess the damage. Fire ants on a post in Florence’s floodwaters. 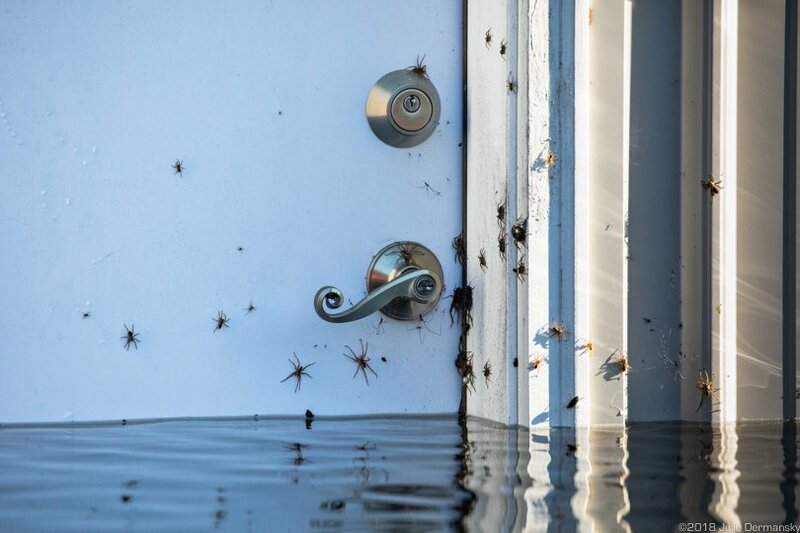 Spiders on a house just above the flood line in Socastee, South Carolina. “[President] Trump visited Conway while embankments and aqua dams were frantically being installed to shore up the coal ash ponds that were the biggest threat to our community,” Jane Ochsenbein told me. It bothered her that Trump didn’t acknowledge the coal industry’s threat to the area, and only a few days after, he went to Wheeling, West Virginia (her husband Chris’s hometown), to promote coal and push for the rollback of regulations there. The Ochsenbeins see the writing on the wall. Three times in the last four years they have had to close their business for extended periods of time due to historic flooding. Though they love the area where they have lived and built their company over the last 20 years, they are considering relocating to higher ground. The Trump administration recently acknowledged that temperatures will indeed continue to rise with increased greenhouse gas emissions. In its latest environmental impact assessment justifying Trump’s proposed pause to vehicle fuel efficiency standards, the National Highway Traffic Safety Administration (NHTSA) predicted that by 2100 the planet is on track to warm by 7 degrees Fahrenheit. Climate scientists have warned that temperature change would be catastrophic. Instead of outright denying climate change, this draft statement accepts it as a given that can’t be stopped. The NHTSA document says that Obama’s earlier plan to improve fuel efficiency for cars and light trucks built after 2020 would not make a significant dent in global emissions and therefore in projected warming. Trinity United Methodist Church, in Conway, South Carolina, in floodwaters. President Trump visited the church before Conway’s Sherwood neighborhood flooded. April O’Leary had a chance to meet President Trump when he visited Conway the week before the floodwaters arrived in the city. Her husband Patrick O’Leary, an airport deputy fire chief, led Trump on a tour of the same neighborhood we kayaked through. However, April doesn’t support Trump’s environmental policies and chose to stay away. When we were done kayaking in the Sherwood neighborhood, we wiped ourselves down with antibacterial cleanser to prevent infections from possible inadvertent contact with the floodwater. Shortly after, we found out that millions of gallons of raw wastewater from a Conway sewage plant were released into the Waccamaw River earlier that day. 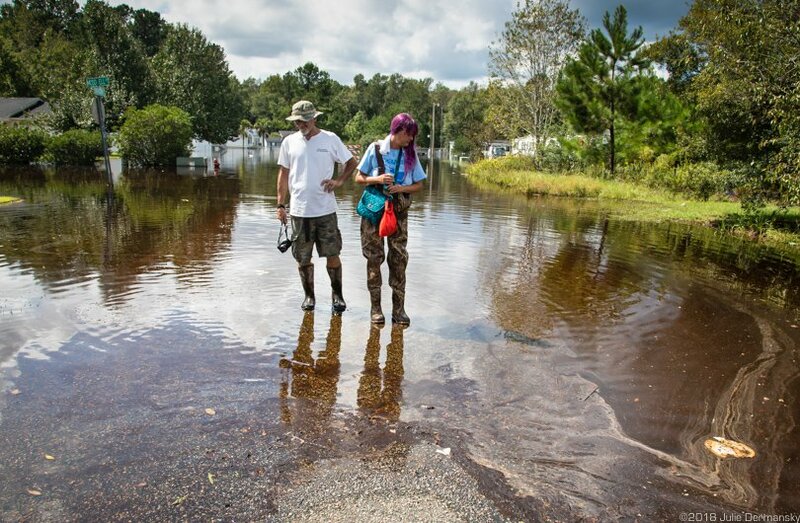 Jane (right) and Chris Ochsenbein in polluted floodwater in Bucksport, South Carolina. Spills like that are why the Ochsenbeins are keeping their business closed for now. Though there are no set pollution standards that regulate their tour guide operations to keep them or anyone else from using the area’s waterway, they don’t plan to start up their business again until the water’s bacteria levels are safe. Florence’s floodwaters have been contaminated by a range of hazardous and unhealthy materials common after floods: untreated sewage, oil and gas from flooded cars, and the added danger of waste from industrial hog and poultry farms. On the bright side, the Ochsenbeins likely don’t have to worry about coal ash in the floodwaters around them since the nearby Granger storage pond wasn’t breached. North Carolina, however, wasn’t so lucky. The bulk of the coal ash from breached ponds there were washed into the Cape Fear watershed, just north of the Winyah Bay basin. Julie Dermansky is a multimedia reporter and an affiliate scholar at The Center for the Study of Genocide and Human Rights at Rutgers University. Follow her on Twitter: @jsdart. Many in North Carolina were left homeless by the storm and its still receding floodwaters. The military may be solace to some after a disaster, but for workers from other countries it’s not a welcome sight. Like meteorological stalls, climate policy stalls can be costly, dangerous and even life-threatening.